Specified as a variable speed compact scrollsaw kit, what makes the Dremel Moto-Saw different to a standard scrollsaw? And does it really match up? In its lightweight carry box, the Dremel Moto-Saw could easily be mistaken for a drill or other electrical tool. Inside however, is all that is needed for the Moto-Saw to be used in its two functions. 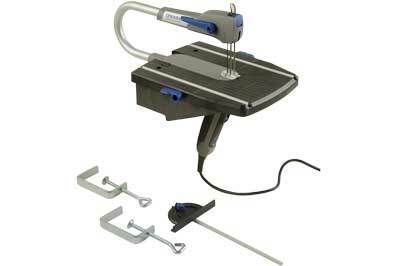 It is designed to be clamped on a base as well as hand-held, which is somewhat of a first for scrollsaw construction. The saw slots neatly into the plastic base, then is clamped to the side of a workbench. Two small clamps are provided, limiting the thickness of the surfaces that the product can be clamped to, which could potentially be a problem for handmade benches. The saw has an auto-tensioning feature to save on having to make adjustments. The blade needs to be kept central while flicking the easy-access switch at the top of the saw, which avoids it slipping to the side. The auto-tension does work very effectively and guarantees the blade will remain tight. When the Moto-Saw gets going it is surprisingly powerful, with no trouble cutting through wood, plastic or metal. The most encouraging aspect is the minimal vibrations created while the saw is running, with the push-down guard helping to hold the materials in place. Like all Dremel products, the saw is designed with the ergonomics of the hand in mind. The comfort grip makes the product comfortable to hold and both the start up switch and speed adjuster on the handle makes operating the machine and staying in control very straightforward. The extraction on the base is a small tube, coming off at the bottom, to coax sawdust to fall through. An extraction unit nozzle could be attached but given the scale and nature of the work cut on this saw, perhaps this is not necessary. 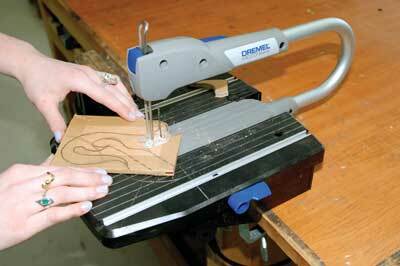 Dremel also provides a range of project ideas that can be found on the website, which is a handy bonus. It is easy to be sceptical of a tool of this size but all it does is allow for easy setup and transportation. There is no compromise on quality or accuracy. The specialist blades are limited to four sizes; this restricts how detailed designs can be cut, but is more than suitable for general sawing. The Moto-Saw has no problem cutting through wood, plastic or metal as specified; the lack of vibration gives for a nice clean cut. When used as hand-held, the Moto-Saw essentially acts as quite a neat little jigsaw; this is the function that gives the user the most control. All in all, perfect for a first time buyer or small-scale woodworking.